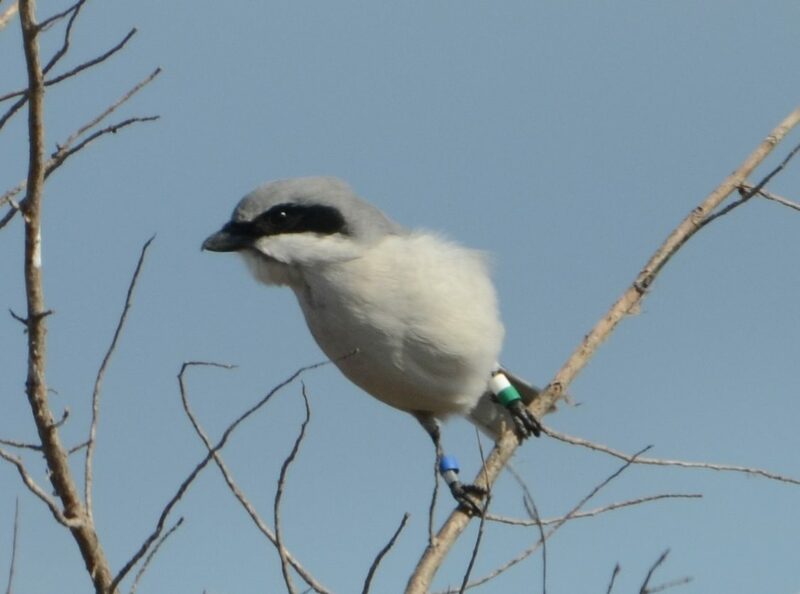 The Loggerhead Shrike on Bennett's Pier Road, sporting colored leg bands from its banding location in Ontario. Image by Jim White, November 11, 2011. I have always been fascinated by the Loggerhead Shrike. It’s hard not to like a bird that is often referred to as the Butcherbird. In fact, the scientific name for the genus to which it belongs is Lanius, Latin for butcher. The name refers to the bird’s habit of impaling its prey on a thorn or barb wired fence to secure it for eating. The Loggerhead and its relative the Northern Shrike are the only passerine (song bird) in North America that kills its prey by severing the spinal column with its hooked bill. Only the size of an American Robin, the Loggerhead Shrike is a ferocious predator taking large insects, lizards, and even small mammals. Lately Loggerhead Shrike sightings in Delaware are few and far between. However, in 2010 and again this year a single bird has been observed in the Milford Neck area along the Delaware coast. This year, long time Delaware birder Andy Ednie found the shrike on Bennett’s Pier Road. Andy and others noticed that the bird was sporting color bands on its legs which led fellow birder Chuck Fullmer to try to find out where the bird was banded. He was able to determine that the bird was banded on June 1, 2011 near Napanee, Ontario, Canada and is one of 21 breeding pairs being studied along the north shore of Lake Ontario. The study is part of the Canadian Eastern Loggerhead Shrike Recovery project. The range of the Loggerhead Shrike has shifted dramatically over the last 300 years. In the 1700’s and earlier, the bird was restricted to the southern areas of the Northern Hemisphere where open habitat existed. As European settlers cut down the extensive forest of the Northern US and Southern Canada to make way for agriculture the shrike expanded its breeding range northward. These Loggerhead Shrikes were able to take advantage of the open habitats such as old fields, meadows, and range land created by humans. The northern nesting Loggerhead Shrikes were migratory, spending the winter in southern areas of the U.S. The shrikes east of the Great Plains wintered in the southeastern U.S. , including in Delaware. These birds are considered by many as a separate subspecies: the Eastern Loggerhead Shrike (Lanius ludovicianus migrans). However, the change in farming practices from small diverse farms to large monoculture operations and the loss of open space to development and reforestation over the last 50 + years has greatly reduced favorable nesting shrike habitat in northern areas– especially in the northeast where they are endangered in eastern Canada and becoming very rare in the Northeastern U.S. Hopefully, recovery projects like Ontario’s will help ensure the survival of the Eastern Loggerhead Shrike. What state-owned wildlife area and birding hotspot is located in the area around Bennett’s Pier Road? The first person to submit the correct answer in the “Comments” section will receive a copy of their choice of one of Jim White’s books (about Reptiles and Amphibians, or Dragonflies and Damselflies). Good luck!